A spontaneous visit to any of the Pacific Grove Museums can awaken a sense of wonder about the mysteries and oddities of the Monterey Peunisula. The natural world right outside this very small, but extremely popular Victorian era town, sets the stage for a couple of museums that can significantly add to the understanding of why this part of the California Coast is so spectacular and attractive to visitors from around the world. Sometimes vacationers in a rush to "Do it all" sometimes forget that a leisurely one hour diversion to a local museum can refocus the nature of your visit to include a little history that can help make the rest of your trip even more enjoyable. Be sure to visit "Sandy" the Humpback Whale before you go into the museum! This is an outstanding local museum that focuses on the natural geography, bird life and fascinating creatures of the Monterey Coast, the beauty of the whales and butterflies that surround this peninsula town. The museum is only a short ten minute drive to the Monterey Bay Aquarium and is a perfect companion visit right before or after a visit to the aquarium. The female grey whale sculpture named "Sandy" at the the Pacific Grove Museums entrance begins what will mark the beginning of a journey to learn more about these eighty thousand pound behemoths that gracefully cling to the Monterey coastline with their young just a stones throw outside the doors of this museum. Docents led tours on Saturdays are a terrific way to learn more about each featured museum display. On the tour you will see the jawbone of a giant Humpback whale and the full skeleton of an Orcas killer whale. Sounds of the whales mating songs just off the coast are played as part of the display. The museum display featuring the Monterey Monarch Butterflies tells of a fascinating journey, and about the nature of these tiny and fragile butterflies that can travel two thousand miles to the eucalyptus trees in Pacific Grove for their winter stay. 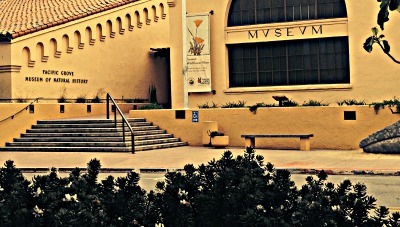 The Museum is open to the public Tuesday thru Sunday and closed on Mondays and holidays. Open from 10 AM to 5 PM. Just a few blocks away from the Pacific Grove Museum of Natural History, is a small park set aside to protect the fragile Monarch butterfly during it's brief stay between October thru early February. Pacific Grove is often referred to as Butterfly Town USA, because of the thirty thousand Monarch butterflies that relocate here from California's Central Valley and from as far away as the Rocky Mountains in Colorado. Many migrating species just like the coastal birds and whales migrate the same migration route year after year. But it's not uncommon for many of the butterflies that arrive here to be part of several generations that have lived and died along the journey, yet their young still find their way to this very spot in the park every year. Their travels can take them over two thousand miles and they often travel one hundred miles a day on tiny paper thin wings. 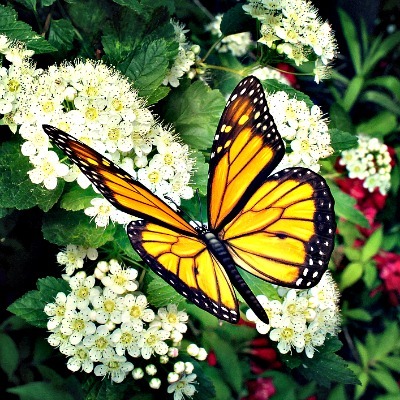 The Monarch Butterfly Sanctuary is easy to find on Ridge Way and Lighthouse Avenue... look for the white picket fences. Be sure to visit after the ambient air is at least 55 degrees as the butterflies cannot fly in cold weather. If you are fascinated by the beauty and migration habits of the Monarch butterfly consider joining our newsletter to receive reminders about when they are returning to Pacific Grove's Sanctuary Park.